Due to the limited depth of this vintage distressed metallic wood picture frame, ideal art items include matted works on paper such as photographs, prints, posters, and other thin items like canvas boards, rigid art panels, thin signage material, and mirrors. The look of this vintage-inspired distressed metallic wood picture frame is perhaps most appropriate for 20th century black and white photography, but contemporary original fine art prints such as etchings and intaglio prints, along with pen and ink drawings, graphite, or charcoal drawings would all be excellent choices to pair with this frame. In terms of color, don’t be afraid to incorporate artwork that features a splash of color to pair with the raw earthy tones of this distressed wood picture frame. 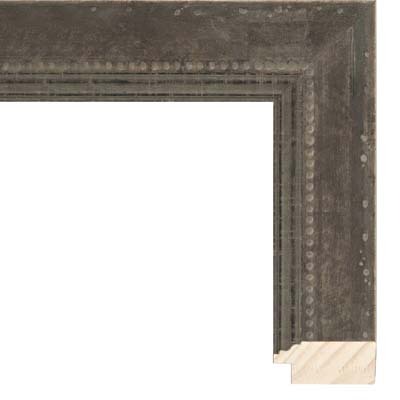 Acid free archival mats to consider with this distressed metallic wood picture frame includes Pewter 9895, Fuzz 9612, Black Belt 9632, Before Dark 9598, Olive Branch 9532, Underbrush 9603, Hedge Hog 9530, Twilight 9809, and White Glove 9500. Subject matter may include architecture, bridges, towers, beams, furniture, people, laborers, and winter landscapes, along with antique signage and home decor.